Hi everyone! I'm here to do another review today! I can't wait to share everything i know about the Clarisonic. I've heard and seen people using it and raving about it. I was having a really bad skin condition that time so i thought maybe i should buy something to cleanse my face better. Maybe i am having pimples because i didn't clean my face well enough. 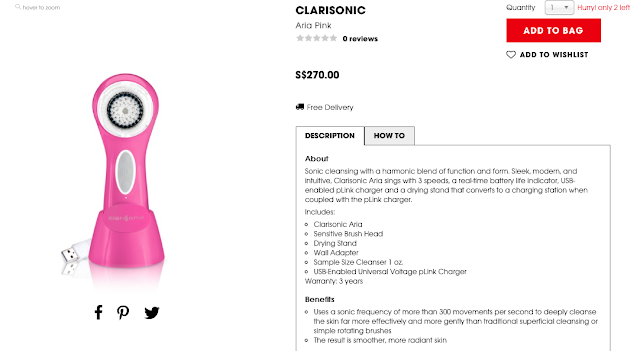 Ok i'm going to research on this clarisonic! And off i went to check on various websites, instructions on how to use it and a lot and i mean A LOT of youtube videos on the clarisonic. And then i decided OK I'M BUYING IT TO TRY. Btw this thing is NOT CHEAP at all. I was really surprised at how expensive one cleansing machine can be. But for my skin... and u know i'm all about skin & health (haha), so i went to Tangs with my boyfriend to check the physical product out (again). I had gone to Sephora a few times to feel the product and check the price and then went back home to do more research before finalising on whether to buy or not. It was near Christmas and my super generous boyfriend, as usual, decided to buy this for me as a Christmas gift. AHA! Saved me $270 (><). Ok la but i was still quite heart pain because his money is almost equivalent to my money. And here's the picture after i got it. I WAS SUPER EXCITED! Because of this, we could join Tangs membership as well. hahaha. Bought the refreshing gel cleanser from Clarisonic along with the machine too. I GOT THE CLARISONIC ARIA. Reason why i got the Aria instead of Mia is because there is a stand for the Aria which i love. Bought the sensitive brush head and deep pore cleansing brush head too. If you have done some research on clarisonic, you will know that there are some facial cleanser sold outside that can't work with this machine. No foam can be built up if you use those with your clarisonic, and that, i've personally tried it and it really doesn't work. I tried this with my Origins Antioxidant Facial Cleanser (u can read my review about this here) and there wasn't much foam coming out of it. So it was recommended that you use along with their own cleanser. And yes a lot of foam does show up if you use with own line of cleanser!!! U will feel that your face cleans really well too. I will give this cleanser a PASS. I even bought the original bigger bottle after finishing up the small bottle. For the sensitive brush head, i give it a pass too. Although face feels clean, it wasn't the effect i wanted. As for the deep pore cleansing brush head, it is a fail for me. Actually u can say its for my boyfriend. He has super large pores and this brush head is meant for him. I used it on him and i don't see visible results. And he stopped using it after the second time. So if you want, u can try and use it for a good 3 months to see if there's any result. Please do share with me though! haha. And then after 4 months of using the clarisonic, i stopped using it because my pimples were getting worse and i thought ok forget it i shall stop using EVERYTHING and just go back to the basic (clean with hand, toner and then moisturiser. I will do a post on my recovery to acne problem soon). And nope... the clarisonic didn't cause me breakouts (which u might have heard from other reviews). I just stopped using because, at that point of time, i didn't know exactly what was causing my pimples!!! So i just stopped using everything. The clarisonic, my new facial cleanser, my essence, my mask, my serum. Everything. Fast forward 5-6 months (my pimples are already healing & everything is settling), i'm using my Clarisonic again. haha. And because i need to change my brush, i decided to try another brush this time. I got the Sonic Radiance Brush Head. Guys, i'm telling you... I FREAKING LOVE THIS BRUSH HEAD!!!! omg..... It gives me that glow i need every time after using it. Seriously, i'm really liking my face after cleansing. So for this brush head, i give it a pass with flying colours! So now i know the brush heads u use can make a huge difference to your face. The clarisonic helps you to clean out effectively and the brush head helps you to achieve whatever result u want from it. The Clarisonic cleans off your make up well too with all the brush heads i've used. 1. I've used it everyday before and now i'm using it just once or twice a week because i feel it may be doing too much on my skin. I use it just for a deep cleanse purpose. So for sensitive skin people, i recommend only 1-2 times a week. 2. Choose your brush head wisely. I bought the sensitive brush head since i have sensitive skin but ended up loving the radiance brush head instead. 3. U don't have to buy the facial cleanser to go along with the clarisonic. Any other liquid type of facial cleanser work as well, just that it won't have so much foam on it. Currently, i'm using my Clinique Liquid Facial Soap with it. I'm a huge fan of clinique products! 4. Change your brush head every 3 months. I follow this instruction obediently because i want the optimal result on my skin. 5. Stop using if any breakout occurs to u. I think maybe i have like 1 or 2 small little bumps showing on my head but that didn't bother me. I put on my clinique anti-blemish solution and i'm good to go. U may try it again after ur breakout is cleared. I think ur skin will get use to it eventually. Ok those are my most honest opinions so far. You know i'm not a person who likes everything even though i like to buy a lot of things LOL. I hear people raving about it and ok i will buy and try it out too and then give my honest review. Not everything is fantastic. Lastly i want to end on my super most honest opinion. You will not die if you don't have the clarisonic. If you are already doing monthly facial treatment, you won't need it unless you have the money to buy it and want to sometimes do a deep cleanse at home. Instead of using the clarisonic, you can go for a cheaper alternative like buying a clarifying mask. The clarisonic is really a more fancy way of cleaning my face. But i do love my clarisonic and the radiance brush head. It does really give u some good result. But you won't die without it. So if you have the money, then buy and try. If you don't have the money, you can just skip this. Alright i hope you enjoy reading my review and i'll see you next time! Bye!